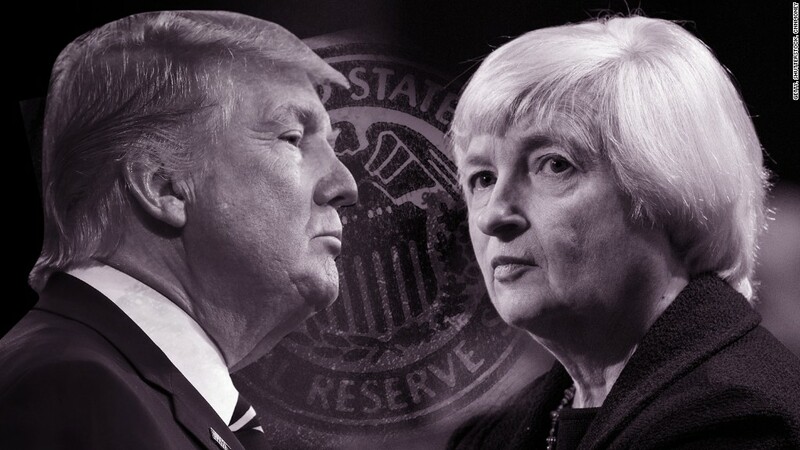 Few mainstream economists believe that President Trump will be able to get the U.S. economy growing at an annualized rate of 4% anytime soon. But he may not have to live up to that promise. Even if the economy grows at a more modest 3% clip over the next few years, Trump will likely be able to take a victory lap. Why would 3% be the magic number for Trump? For starters, a 3% growth rate is better than what the U.S. economy has experienced lately. GDP has hovered around 2% or so. If the economy gains enough steam so that 3% growth is sustainable, that would probably mean even more job creation, higher wages, increased productivity and stable stock and housing markets. In other words, Wall Street and Main Street will approve. Is 3% doable? A lot may depend on how quickly Trump is able to get his numerous economic proposals through Congress. Tax reform. More infrastructure spending. A rollback of Obama-era regulations on banks and health care companies. Trump has a lot on his plate. But Bill Sandbrook, CEO of U.S. Concrete (USCR), thinks Trump will be able to deliver 3% growth. Sandbrook voted for Trump and he continues to be impressed by the fact that the president is willing to have an open dialogue with business leaders about what needs to be done to boost the U.S. economy. He thinks that more companies will start to hire more because there is increased confidence about what's going on in Washington. Kelly Bogdanov, an analyst at RBC Wealth Management, agrees. "If we get tax cuts, we could see growth of 3% or more this year and next. The corporate tax cut is the linchpin," she said. "If we get sweeping tax cuts, that could give us a substantial boost. It could take us from a subpar recovery to a more normal one." One big reason for this optimism? Most companies have been building their cash reserves, reducing expenses and lowering their debt levels so they are ready to spend when the time is right. There isn't excess out there like there was with tech stocks in 2000 and housing in 2007. So any reform from Washington could pay huge dividends for a leaner and meaner Corporate America. "The economy has been trapped in a 2% growth cycle for the past few years. If we get to 3%, that would be a big boost for companies that have cut costs," said Bruce Bittles, chief investment strategist with Baird. Consumers, which power more than two-thirds of the economy with their spending, appear to be more flush too. They've also been cutting debt levels and saving more. U.S. economists at Deutsche Bank said in a report Wednesday that consumers may soon increase their spending. "Given the dramatic improvement in consumer finances, households may be on the cusp of a meaningful breakout in spending, especially if the Trump Administration is able to come through on individual income tax cuts later this year," the economists wrote. The Federal Reserve may be cooperative too. The Fed raised interest rates again last week. But Fed chair Janet Yellen signaled that it's not going to go overboard with rate hikes. And it's not just the U.S. that is gaining momentum. Some economists believe that the global economy is finally due for more reliable and consistent growth. "For all the shocks that have arrived over the past nine months -- Brexit, the U.S. election, the Italian referendum and French political concerns -- economic activity has improved since the middle of 2016," said Larry Hatheway, chief economist with GAM. "There is a resilience to this economy," Hatheway added. "It's not supercharged and fueled by debt." Nonetheless, there are still some big risks that could prevent the economy from growing anywhere close to 3%, let alone 4%. It's possible that Democrats -- and even some more fiscally conservative Republicans -- could balk at Trump's spending proposals. Any snag in DC could hurt the economy and markets. "One key issue for the economy is how consumer and business sentiment, as well as financial conditions, will respond if implementation of Trump's economic policy agenda is disrupted. The trajectory for economic policy remains highly uncertain," wrote Lewis Alexander, chief U.S. economist at Nomura, in a report this week. Alexander added there are growing concerns about a government shutdown at the end of April if a new spending bill is not passed in Congress. But for now, the Trump believers still outnumber the skeptics.